Giving to United Way of Cowlitz & Wahkiakum Counties is an investment in our communities, and an opportunity to bring health and happiness to local families and individuals in need. 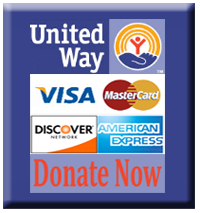 United Way offers a number of convenient and efficient giving options to accommodate your situation. United Way of Cowlitz & Wahkiakum Counties most popular method of fundraising is through the workplace. We partner with area businesses to conduct “campaigns,” allowing employees the opportunity to make thoughtful decisions about their charitable options. Individuals may contribute to United Way by making a direct gift. You can do this by sending a check, bringing in cash or calling us to set up billing options. You may also contribute securely online using a credit card by clicking the "Donate Now" button above. At the heart of every good and significant human effort we find a leadership group that gives the organization strength, character, purpose and longevity that distinguish it from all others. Cowlitz County United Way draws its strength and character from this unique leadership group. Who are these leaders? They are people like you – people who care about our community, who are positive, who commit to tough goals, and reach them, who have both motivation and the means to provide for their community, and who inspire friends, peers and associates to follow their example. Leadership Giving represents a new level of community participation, an indication of deeper involvement and a desire to do more. With a contribution of $500 or more, leadership contributors strengthen United Way and significantly increase its ability to provide needed human services. This community’s future rests with people like you who are willing to share a part of themselves with their neighbors. We ask you to accept the challenge, make a commitment and set a leadership example for others to follow. Personal Satisfaction – a good feeling knowing you are perpetuating the ideals upon which United Way was founded and that your contribution helps in the search for positive solutions to community problems. Personal Example to Others – through a willingness to influence others by providing leadership for support to the important services provided by the Cowlitz County United Way funded agencies. Recognition – each member will receive personal recognition. His/her name will be listed in the annual United Way tab distributed in The Daily News. Organizations may go beyond the collective gifts of their employees and make a contribution representing the community commitment of the company by matching the employee gifts, making a corporate donation or awarding grants. Memorial Gifts, Stock Transfers, Real Estate and In-Kind donations are always welcome. For information, contact our office at 360.423.5320.